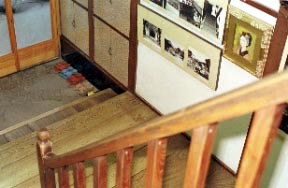 The inn of a wooden two-story building facing the clear stream of a Kano river.For a while, upper hillside, the appearance of an enough Entrance impresses a hidden hot spring in a place, and, as for inside of a hall, as for a glimpse of a history, there are a ladder step from which the wooden floor of a zelkova and Yasunari Kawabata took down the waist, a room "Kawabata-san" which had "the dancer of Izu" written, etc.A good-location-to-see lobby and the extensive garden are the effect of a graceful resort about a Kano river.The full credit style of the hot spring is carried out, and the hot spring which flows out of the open-air bath built by the riverside serves as a flow of a river as it is. As for the opening of hunting season on a sweetfish, fishing rod one hand also has many fishing guests who quit a lobby to a backyard Sunday of the May last. ... I took down the waist to the halfway of the ladder step, and was seeing absorbedly the dancer who has passed to the inn dance by the wood floor of an Entrance.It quotes from --- "dancer of Izu." 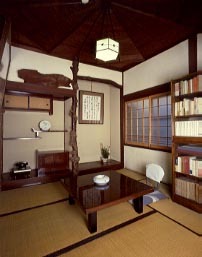 The room where Yasunari Kawabata had "the dancer of Izu" written remains in the figure as it is.Use as a guest room is not carried out. A "female indoor-hot-spring" hot spring and a bath tab are beauty and free-flowing hot-spring water. Gustation (it is a wild boar in wild grass, a sweetfish, and winter) and delicacies from the sea of a mountain of Amagi. It is a wild boar of a hunting in the fresh seafood of the Numazu port landing, the sweetfish of a Kano river, and winter. rate - Food cooked in a covered earthenware pan (beef, vegetables, and fish) does not take in summer, and the fish row slices, the vinegared, the simmered dishes, roast fish (a sweetfish, a mountain witch, etc. ), and mouth of boar stew and the sea do not take in winter. * It is a crab dish by a Rates. 13000 yen - 25000 yen, the room and a dish, and the number -- measure. * The New Year is an extra charge. 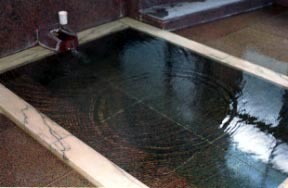 The open-air bath in which charter use is possible is 1. 17 rooms, 8 room with an inner tub (hot spring). It is before [ a Nishihira bridge ] bus stop -> on foot 2 minutes at the time of a yugashima going bus. 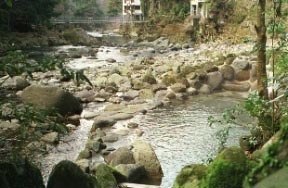 It is Amagiyugashima hot spring mouth stop -> on foot 7 minutes at the time of the forest going bus in Kawazu and Showa.